Over-the-counter retinol, more commonly known as vitamin A, is one of the most effective skin-transforming and rejuvenating ingredients. However, despite the mountain of research attesting to its benefits, many people are still unclear about how to fit retinol products into their skincare routines. This quick overview will answer your questions—and help you transform your skin’s appearance. Retinol, also known as vitamin A, is a cosmetic ingredient often found in anti-aging products like facial creams, serums, and eye creams—because it can be aging skin’s best friend. It can minimize the appearance of wrinkles, improve uneven skin tone, shrink the look of enlarged pores, and reignite a feeling of firmness and radiance. You’ll also see derivatives like retinyl palmitate, retinaldehyde, retinyl retinoate, and retinyl proprionate widely used in skincare products—though experts worldwide consider pure retinol to be far more effective. That doesn’t mean these other forms don’t work, just that pure over-the-counter retinol is more of a powerhouse ingredient. How Do I Choose a Retinol Product? Packaging matters. Retinol is sensitive to air and light exposure, which means products will become ineffective if they’re packaged in jars or clear containers. Be sure that all the retinol facial creams or serums you purchase are packaged in opaque, airless, and/or air-restrictive containers. Choose products based on your skin type: creams are generally best for dry skin, lotions for normal to combination skin, and serums or gels for oily or congested skin. That said, it’s also fine to choose a retinol facial product based on its texture or your personal preference. Find one that pairs well with the other items in your routine, that feels good on your skin, and that delivers results. If an over-the-counter retinol cream or serum doesn’t seem to be working well for you after a few weeks, try another; it might take some experimenting to find your perfect match. 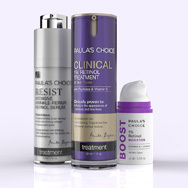 There isn’t a single best over-the-counter retinol product—which is why Paula’s Choice Skincare offers various textures and strengths: so you can find the one that’s right for your skin type and skin concerns. Our advice? If you’re new to over-the-counter retinol, begin with a lower concentration serum or moisturizer. If you’ve used retinol in the past and had great results, consider a moderate-strength product. And, for more tenacious concerns like deep wrinkles and a pronounced uneven skin tone, look to one of our higher-strength retinol products. You can also alternate lower and higher strengths, based on how your skin responds. We recommend them as part of a nightly skincare routine, when most people don’t mind adding an extra skincare step or two. But it’s fine to use retinol in the daytime, as long as you finish with a broad-spectrum sunscreen rated SPF 30 or greater. As always, cleanse, tone, and then apply your AHA or BHA exfoliant. You don’t need to wait for it to absorb; apply your other products immediately after, beginning with the lightest textures first. Finish with the creamiest or thickest product. For example, if your retinol product has a fluid texture, you’d apply it directly after your AHA or BHA exfoliant and follow with the other products in your routine. If it’s a cream or lotion, first apply your lightweight booster, essence, treatment, or fluid serum products, and finish with the retinol cream. If you’re using a rich creamy moisturizer as well, apply that last. Other anti-aging, rejuvenating ingredients like antioxidants. Visibly restorative ingredients like niacinamide. Can I Use AHA or BHA Exfoliants if I’m Using a Retinol Product? For the best anti-aging benefits, it’s ideal to use both an exfoliant and a retinol cream as part of your regular skincare routine. Retinol doesn’t exfoliate skin—that’s a common misperception because retinol causes flaking skin for some people; however, flaking is not necessarily a sign of exfoliation. AHA and BHA exfoliants are gentle, hydrating, and work imperceptibly to help skin shed its dead surface layers more quickly, the way it did when you were young. They also help improve signs of environmental damage, leaving skin smoother and more radiant—another reason we recommend you use one along with your retinol product.